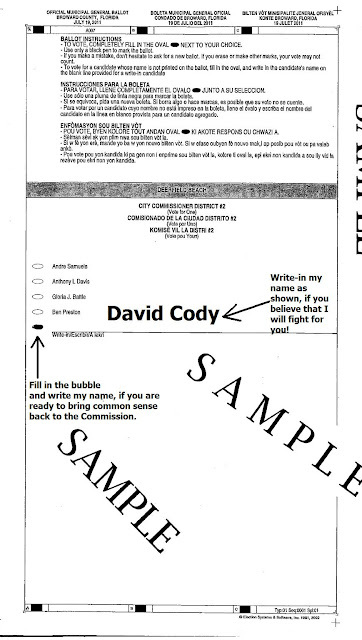 This is a copy of the sample ballot for the Deerfield Beach District 2 Special Election on July 19, 2011. Look at how simple it is to vote and bring common sense and practicality back to Deerfield Beach. I will fight to repeal the Unfair Utility Tax! I will fight to ensure that all viable cost saving options to the City are reviewed. I will fight for "All" residents of District 2. If you don't feel like going to the polls you can always call 954-357-7055 to request an absentee ballot and vote for me in the comfort of you own home. Electioneering communication approved by David Cody, non-partisan, Deerfield Beach City Commissioner District 2.